Property 3: Beautiful spacious Apartment with stunning sea views and centrally located. Property 8: Panoramic sea views. Beach 100m. Spectacular! Property 10: New luxury apartment in a prime location in the trendy Green Point with sea views! Property 22: Spacious home w/ private pool and beautiful views - minutes to the beach! Property 30: Beach 50 meters away, 1st floor Apartment with A View. 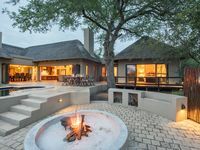 Modern & spacious villa minutes from Kruger National Park. Property 32: Modern & spacious villa minutes from Kruger National Park.